Over the years Amlwch has had a number of residents who’s influenece has streched far beyond the local communities. The history of just some of these people is recorded below. In 1917 William Williams was awarded the Victoria Cross for his role in the sinking of a German submarine. On 21 July 1917 an Anglesey seaman, William Williams, received the Victoria Cross, Britain’s foremost gallantry award. The citation on the award read ‘selected by the ship’s company of one of H.M. ships to receive the Victoria Cross under Rule 13 of the Royal Warrant’. This vague citation led this and other similar cases to become known as the ‘Mystery VCs’. What lay behind it? During World War I (1914-18), the German Navy attempted to blockade Great Britain, using its submarine (U-boat) fleet to cut off food and vital supplies. One tactic used by Britain to trick the German submarines was to use armed ships disguised as merchant ships. These were know as ‘Q-ships’. These ships went to great lengths to ensure that they were attacked, in the hope that the submarine would then surface and expose itself to the hidden guns of the Q-ships. Williams served on several Q-ships and already held the Distinguished Service Medal for his part in the sinking of a German submarine in February 1917. 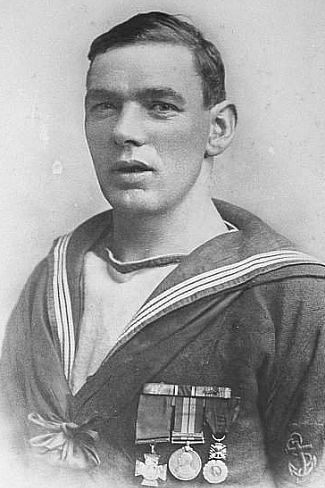 Williams was awarded the Victoria Cross for his involvement in the sinking of the German submarine UC-29. The crew of the H.M.S. Pargust were seen to abandon their disguised Q-ship – complete with a stuffed parrot in a cage – but unknown to the Germans, a small number of men remained hidden on board. For over 30 minutes, Seaman Williams held in place the starboard gun port, its releasing weights having been freed by the torpedo’s explosion. His actions prevented premature exposure of the gun until the moment came to open fire when the German submarine eventually surfaced nearby. The achievement of sinking UC-29 was recognized by the award of the Victoria Cross to H.M.S. Pargust, the first time a ship had been honoured under the Rule for rewarding an act of collective gallantry. One officer (Lieutenant R.N. Stuart) and one rating were elected by the crew to receive the award. Williams, whose quick thinking and strenuous effort had saved the day, was the rating. His distinguished career held one more twist: on 8 August 1917, H.M.S. Dunraven (Pargust’s successor and another Cardiff ship) was sunk off the French coast after a five-hour battle with another submarine. Williams received a bar (second award) to his DSM for his gunnery work on this occasion: his third gallantry award in under six months! William Williams was discharged from the Royal Naval Reserve in November 1918. He settled in Holyhead and was a founder member of the local branch of the British Legion. He died on 23 October 1965. William Williams’ medals. Left to right: Victoria Cross, Distinguished Service Medal with second award bar, Great War service medals (1914-15 Star, War Medal, Victory Medal), Defence Medal 1939-45, Coronation Medals (1937 and 1953), France, Médaille Militaire. 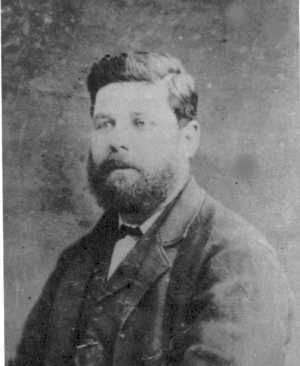 William Thomas was an Amlwch ship builder. In 1870 captain William Thomas extended his ship building interests by developing a new ship building and repair yard at the port of Millom in Cumbria. In the same year he made an application to built a vessel off 100 feet keel at the upper end of Amlwch harbour. This vessel was the 79 ton schooner Lewis & Mary. Her maiden voyage was to take Ochre from Dyffyrn Adda to Runcorn and to return with phosphate from Bristol to be used in the Hills fertilizer works. In May 1872 Captain William Thomas brought the ship yard previously belonging to Nicholas Treweek. In the same year William Thomas built the 119 ton schooner Holy Wath. Which in 1874 was followed by the Cumberland Lassie ( at 230 tons the largest to be built at Amlwch at that time) and the Baron hill two years later. In 1875 Thomas built a pilot boat called the Mersey for the Liverpool pilot service. She was a 110 ton sail schooner. It was not until 1883 that the first small screw steamer was built at Amlwch. She was the 180 ton W S Caine, which cost £5000. Over the next 15 years many more vessels where built and launched at the yard. In 1887 William Thomas relinquished the control of the Millom yards but continued to repair and build at Amlwch. 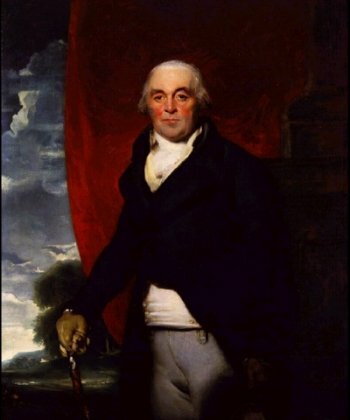 Captain Thomas’s eldest son William Thomas a trained navel architect also began to influence the design of ships built at the yard. Miner credited with making the great discovery of copper at Cerrig Y Bleddia ( Mona Mine) on 2nd March 1768. He lived rent free in his cottage until his death 14/8/1786. Buried at St Eleths,Amlwch. Jonathan Roose was the mining supervisor who’s men first rediscovered ore in large quantities on 2nd March 1768. He divided his men up into a number of crews and set each to work digging in an area close to a stream. The miner who discovered the ore was called Rowland Pugh. His prize for discovering the rich seam was a bottle of brandy , an annual “Chairing” and the right to live in a rent free cottage for the rest of his life. Jonathan Roose remained at the mine for many years and was to supervise much of the work under Thomas Williams when the workings in the Great opencast were at there zenith. He died on 6th February 1815 and his tomb stone can still be seen in the Parish Church at Amlwch. The tome stone bears the following inscription which describes the work of the man. First drew it’s mineral blessing from the ground. Those laboured mines which he fought to drain. In 1778 a new company was also formed to extract brimstone from the ores on the mountainside. Thomas had copper warehouses in London , Birmingham and Liverpool. He erected smelting works in coal fields on South Wales and Lancaster. This was important as Anglesey coal was poor for smelting and each tonne of ore needed 3 tonnes of coal. He campaigned vigorously for the reduction in duty on coal carried by coast to try and improve the smelting and pumping costs at the mine. Copper works were built at Flint and Penclawdd to make copper and brass products. Many of these materials were for use in the African Slave trade. Thomas invested £70,000 in this trade and petitioned parliament in 1788 when a bill was being discussed to prevent British Ships carrying slaves. He also introduced the use of copper bolts to fix the copper sheeting to Navel vessels and seem to have sold then to all sides in the naval conflicts. At Mona mine the old 21 year lease to Roe and co had expired in 1785 and a new company was formed. 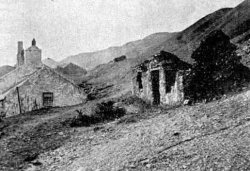 This was know as the “old” Mona Mine company and was still confined to the Cerrig y Bleddia area. Thomas William’s became a partner in this new company when Bayly sold his share to a London Banker. Under the Roe and co lease only the best parts of the mines had been worked. Towards the end of the lease the whole area had lacked investment and had poor facilities. James Treweek became the new Mona mine Manager in 1811 and moved with his family to Mona lodge in Amlwch. He had a lot of experience of mining in Cornwall and brought Cornish men and methods with him. He was in charge of the mine and transport to and from the port. He was also in charge of hiring and firing at the mine. This gave him great power and lead to complaints of nepotism. He was responsible for the setting of the price to be paid for each area of the mine to be worked. These “bargains” were publicly set every fortnight with a ” Dutch auction” method being used. The lowest bidder getting the work. By 1828 Treweek was also in charge of the precipitation pits at the mine and his control was extended to the operation of the Parys Mine. A few years later he was in control of all aspects of smelting at the mine and at Amlwch port and was also responsible for all movement of shipping for the mine in the port area. He reported to Sanderson who was Lord Uxbridge’s estate manager. One of his other duties was ensuring that sufficient coal and timber was brought into the port during the summer months to enable the mine to last over winter. In 1830 he advised Lord Anglesey on the application for a concession on the duty on candles and timber which was already given to the Cornish miners. He also secured a rebate on the coal duty for the transport of coal to Amlwch. He was responsible for paying the smoke trespass to the Curate of Amlwch for the nuisance caused at the curate’s residence by the fumes from the smelting works. He also paid the ” English duty” to allow an English service to be held in the church each Sunday. When Treweek came to Amlwch the smelters were only seen as a means of concentrating the ore. Treweek saw there potential in there own right. He paid particular attention to their development and even started to bring in ores from other parts of the country to smelt with the local ores. By 1820 the Mona mine had 16 smelter furnaces and the Parys works 9. The output of each group of smelters was around 350 tpa. As the production from Mona and Parys mines dropped additional material was brought in form other parts of Britain. The two master smelters at this time Rees and Morgan also reported to him. Treweek’s influence in the Amlwch area went beyond the mine. He was the election agent for Plas Newydd. He arranged all the big occasions in the town and played host to the important visitors to the area. In 1831 he arranged a dinner for 1400 people on the mountain to celebrate the Coronation. Treweek held control of all these aspects of mine operation until his death in 1851. His family then took control and were also influential in the Amlwch ship building industry which developed in the middle of the 19th Century. In 1779 a group of merchants built a house near Point Lynas for the guidance of ships by placing lights in the windows. The first keeper or Governer of this light was Robert Beaver. He was born in 1748 at Aberfraw the son of John Beaver a schoolmaster. He went to sea at an early age. By the age of 28 he was in command of his own ship. His ship partially loaded with linen and other manufactured goods set out on a voyage to the coast of west Afica. This being a period of great prosperity for the slave trade. After unloading his cargo he filled his ship with slaves and after an absence of two years made the return voyage with a cargo of sugar and cotton from the west Indies. In 1778 at the age of 30 he was in command of a privateer. An armed ship called Juno of 24 guns in the war against the French and Americans. He later became the commander of the 28 gun “Hero”. In October 1782 he retired from the sea having captured more than 50 vessels as prisoners in 4 years and settles in Maes Llwyn a property owned by his wife. His wife was a daughter of Hugh Rowland Hughes. This man had 23 children, had been married 4 times and died at the age of 114 years. At his funeral in Amlwch church were 84 of his offspring. Robert Beaver was honoured as a hero of the sea and took up the job of light keeper at Point Lynas. He later sold Maes Llwyn to John Paynter who demolished and rebuilt the house when he became a ship builder at Amlwch. On Wednesday, February 20th, 1828: James Webster, the proprietor of the Parys Mountain sulphuric acid works, stands in the window of his home, Fudrol, observing the huge funeral procession as it makes its way to St. Eleth’s Church; he is full of memories. It is the funeral of Cadi Rondol, or Catherine Randal as recorded by the Rev. William Johnson in the Amlwch parish register. The Randal family probably came to Amlwch with the first wave of immigrants to work on Parys Mountain between 1761 and 1775. Jane Randal, Catherine’s mother lived in Parc Bach near Glanrafon and was buried on the 2nd September, 1794. Cadi Randell had been born in 1743. It appears that there were two daughters: one, Ellen, married Henry Wilson on October 18th, 1775 in the old parish church, when her sister Cadi, was thirty two years of age. It is interesting to note that Ellen was able to write her own name, and it is likely that Cadi, too, was literate. She could be violent, too, as John Jones (1762-1822) a elder at Capel Mawr, found to his cost. He tried to calm her down as she was cursing everyone in the street. Cadi turned on him and threatened him – the very pillar of respectability – with a knife! However, some time after 1788 Cadi Rondal was converted in the ‘Capel Mwd’ at Pengraigwen and became a faithful member of the ‘society’ at Lletroed Chapel, and tramped the countryside from chapel to chapel to listen to the gospel. On one occasion she walked to Llanfwrog and in her ecstasy jumped up on the pew and wrecked it. Another time she suddenly remembered that she had left the dough to rise, she grew agitated and shouted that Satan would not leave her alone! According to a Plas Newydd rent book ‘Catherine Randol’ rented a small cottage at Dyffryn Coch’ for which she paid a rent of two shillings to the Marquees of Anglesey – the lowest rent on the estate. Her funeral was paid for by James Webster, but no gravestone was erected to mark her final resting place. But with or without a stone, the name of Cadi Rondol has not passed into oblivion. The historical Scottish Alexander Fraser of Beaufort was of the House of Lovat, the Fraser clan prominent around Loch Ness. He was born around 1663 and was educated at Kings College, Aberdeen from 1678 to 1683. In 1689 he led a branch of the Fraser clan in the Jocobite’s campaign against the King’s force. In 1692, Alexander attended a ball where a bagpiper antagonised him by playing the tune “ The biotag air Mac Thomas” which was disparaging to the Fraser clan. In a fit of anger Alexander stabbed and killed the piper. Because of this incident and his position as a Jocobite leader, Alexander decided to flee his homeland. Some controversy exists over these dates as according to some reports Alexander was killed at the Battle of Claverhouse in November 1689 and was buried at Kirkall. Other reports suggest that the burial record was a cover for his flee from Scotland after killing the piper a few years later. Alexander Fraser was said to have been given sanctuary and employment by the Marquis of Powys. Over the following year’s Fraser became knowledgeable in his Lordship’s mineral interests and became a prospector in both north and south Wales. The Welsh Alexander Fraser is first recorded as working in the mines of Penrhyn Du in 1733 He married in south Wales in 1738. If this was the same Alexander Fraser as that born around 1663 he would have been 75 years old. In 1761 the Welsh Fraser persuaded Sir Nicholas Bayly to start to prospect for copper at Parys Mountain. In 1762 with the assistance of Jonathon Roose and Roland Puw a large quantity of ore was found near Cerrig y bleddia This eventually lead to the development of the Mona and Parys mines. At this time Fraser was said to be almost illiterate and it is difficult to reconcile this with the years that the Scottish Fraser is known to have spent at Aberdeen University. Fraser was employed at the mines until his death in 1776. (Aged 113 ?!) His sons continued to work at the mines. The advanced age of marriage and death suggest the possibility that two different Alexander Fraser were somehow involved in this tale. From the time that copper was discovered until his death Fraser remained in hiding in Anglesey. He did not pursue any claim to his father’s estates, as he was still wanted for murder in Scotland. Although it is said that local people new of his background and often referred to him as Lord Lovat or Lord Fraser. Elizabeth Roberts was born in 1788 and in 1884 she recalled seeing John Fraser as a superintendent in the iron pools. She always knew him as Lord Lovat. Even the Managers of the mine gave due regard to the Welsh Fraser. Thomas Williams the mine manager is said to have shown respect when some buildings in which Fraser was living were not destroyed during mine development. It was also recorded that John Sanderson the Marquis accountant and general manager agent used the title “My Lord Fraser” and showed the man due respect. 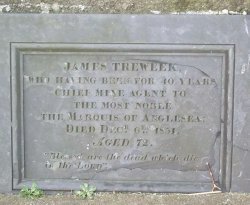 As did the chief mine captain James Treweek. This respect was based on the attitude of the marquis’s family itself. From the first records in 1733 to the court case in the House of Lord in 1885 they supported the Welsh Fraser’s claims. The Welsh Fraser had four sons. His eldest, called John went to Inverness in 1812 to try and progress his claim. The same claim was pursued by successive generations until in 1885 John Fraser (IV) had his case turned down in the House of Lords. The House of Lord found it is difficult to reconcile the dates of birth and deaths with the same man. One likely possibility is the Welsh Fraser’s may have been descended from a, possible illegitimate son, of the original Alexander Fraser of Lovat.